We had an in-service today and it was split into 2 parts. In the morning we had a local university professor who travels the country helping kiddos read fluently. His name is Dr. Tim Rasinski. He has written many books and participated in a lot of reading research studies. He was very inspiring. The two biggest things I took away from his visit were I need to be singing and reading poetry with my kiddos EVERY. SINGLE. DAY. and that my kiddos need repeated readings whether it is reading with me, their parents, or listening to reading on tape/computer. He shared so many stories of increased reading performance in kiddos who were well below grade level through the use of poetry and repeated readings. Of course there was more, but those were the biggies. He was such a great speaker! In the afternoon we had another speaker and she talked to us about SLO's. She came from a nearby county and gave us some much needed info. After her visit I feel much better about creating these SLO's. All in all it was a gooood day! 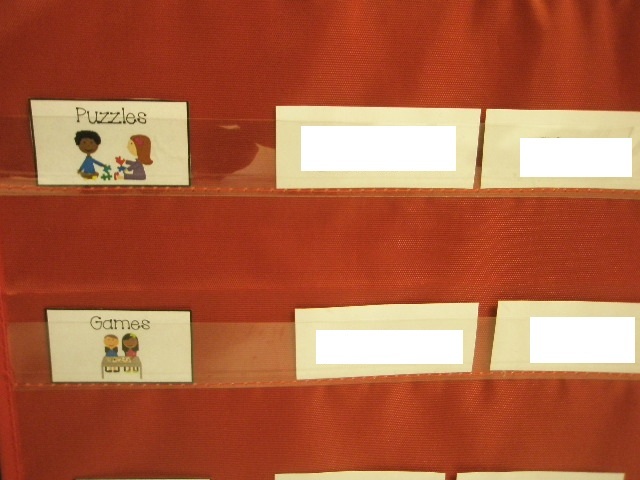 I shared my inside recess centers with you last year, but I have now created signs to go with them. You can see my last year's post here. 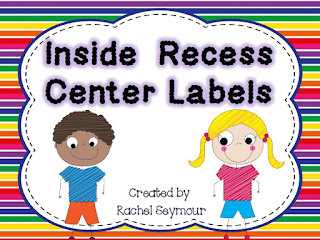 Here is my Inside Recess Center Labels Freebie to help you with the long winter days of inside recess craziness. 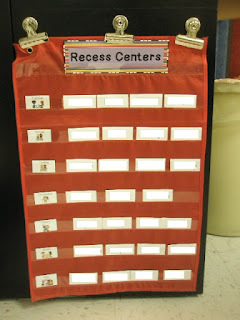 I have 7 inside recess centers. Each group has 4 kiddos in it. This is because I only have 4 computers. I rotate the centers every day so they only get to each center every 7 days...this helps keep them from getting bored. I have a small pocket chart that I got at Target. I have a picture card at the beginning of each line with four kiddos following. The first kiddo in each group is the one who gets the recess center out of my cabinets and puts it back. This keeps my 28 kids from gathering at my back cabinet and not being able to move. Each center has a certain place in the room. The first person gets their group's things and takes them to their group. The rest of the group goes to their spot and waits. 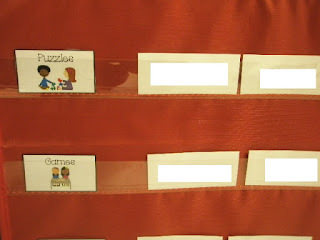 I have a larger size picture card matching the one from the pocket chart in my recess cabinet so my kiddos know exactly what they are doing and where everything belongs. 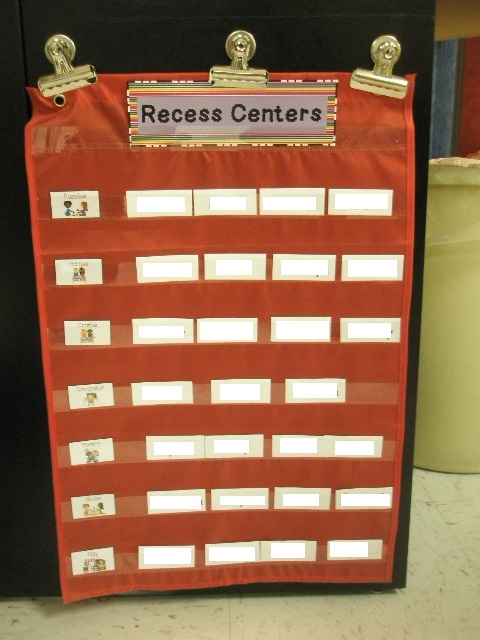 These centers cut down on the inside recess craziness. Now they don't argue over what to do or who to play with and there is no arguing over who has to clean up and put the toys away. Inside recess is soooo much more tolerable with centers. Here's to a quick winter so we can get back to outside recess!! Love Tim Rasinski! You lucky girl, you! For Indoor Recess we have our kids bring Indoor Recess Busy Bags...they each get a gallon sized ziplock bag that they fill with their parents and bring to school to be used during Indoor Recess. That has cut down on the craziness for us! Love your centers idea! Hope you've entered my giveaway! 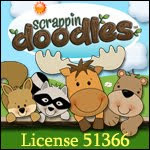 It includes money to spend at Erin Condren! Growing Firsties is having a FAB 400 Giveaway!